For a few years now I've been compiling and publishing the MARS Ratings of all AFL Teams, which I calculate using ELO-style algorithms specially calibrated for football. There are six numbers that need to be chosen in that framework: C, M, Cap, Divisor 1, Divisor 2, and Home Adv. Any set of six numbers defines a different MARS algorithm that will respond differently to game results. 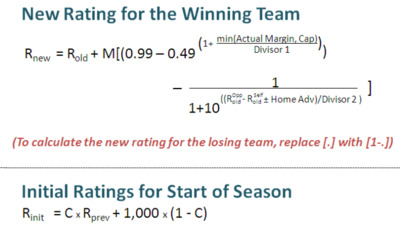 Since its inception, MARS has had the same six numbers for these free parameters, chosen with one-part science and nine-parts art way back in 2008 such that the resulting ratings did a reasonable job predicting winners yet also produced team rankings that seemed to make sense. During the off-season I've been reviewing the original choice of these six numbers and discovering that MARS raters with different numbers are better at predicting some aspects of footy games than others. Traditional MARS is the MARS rater you're already familiar with. Whilst it'll be around again this year, none of the tipping or wagering algorithms will be based on its opinions. It's still the rater I think provides the best view of a team's underlying skill, but I've come to believe that I'd rather be backing form than talent. Probability Prediction MARS is a MARS rater that's been optimised to estimate result probabilities. I'll be publishing its probability predictions this year and using them in one of the Fund algorithms (more of which in a future blog). It adjusts ratings far more on the basis of single results than do the other raters: its average adjustment is 34.3 ratings points whereas Traditional MARS' is only 2.6. Line Prediction MARS has been optimised to estimate line results. Its ratings will be used in another of this year's Fund algorithms. It also adjusts ratings on the basis of a single result more than Traditional MARS does, with a typical game producing a change of 4.7 ratings points. Winner Prediction MARS is the MARS rater philosophically most similar to Traditional MARS in that it too has been optimised to predict winners, but it isn't concerned at all with providing any indication of a team's underlying skill. Its typical rating adjustment is 7.2 ratings points per game, making it the second-most responsive MARS rater in the family. To give you some idea of the differences between the raters, the table below shows all the pairwise correlations for the four MARS Raters. What's clear from this table is how different Probability Prediction MARS is from the others since its correlation with them ranges no higher than +0.37. On the other hand, Traditional MARS and Line Prediction MARS have a lot more in common as their ratings correlate at +0.80. Traditional MARS is moderately correlated with Line Prediction MARS and Winner Prediction MARS, with both correlations around +0.50. I'll write more about these MARS raters as the season progresses.